Advances in cooking technology have brought energy efficiency to new heights. Energy efficient ranges save 20-30% more energy and provide more control and features than ever before. If you currently have a gas oven or stovetop, switch to electric and have an even bigger impact! Cooking technology has advanced. New features and designs allow for highly efficient cooking along with improvements in function and performance. Your range is also an opportunity to make a big impact on climate change—if you currently have a gas range, switching to electric can significantly lower your impact! New electric ranges are just as responsive as gas and far better for the planet since they can be powered easily with clean renewable electricity. If you cook often, an energy efficient oven or stovetop can go a long way in lowering your energy use and saving you money. However, if you’re not quite ready to invest in a new range, you can still save energy by adopting energy-wise cooking habits. Read on for more information! 1When to upgrade and should I go electric? The annual savings from upgrading to an energy efficient stove or oven are good! But the upfront expense of a new range ($500 - $1,500) means it could take 5 -10 years to recover the cost of upgrading. For this reason, it is generally recommended to plan this action when you are ready to upgrade your range. If you spend a lot of time in the kitchen, you can recoup your costs faster. Check the estimate of your annual savings in the stats section above to get a good idea of your expected savings. If you’re not ready for an upgrade, add this action to your list and schedule it out for later! Consider Going Electric. One of the most important actions we can take to reduce carbon emissions is to choose 100% green (renewable) electricity for our homes and then switch all appliances to electric. If you have a gas range now, consider switching to electric. An electric range powered by renewable, clean energy—makes you a carbon-free chef! Learn more about green power options on the Choose Green Electricity action. I know, you love to cook and you love your gas stovetop! Well, you might be surprised. 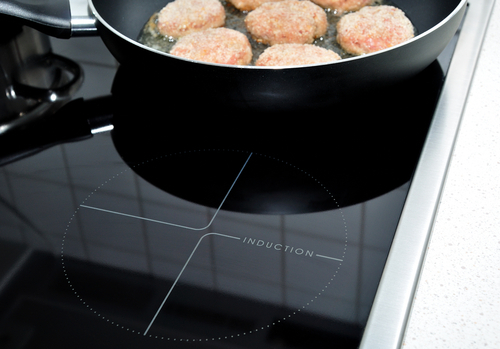 An electric induction cooktop provides the same, if not better, heat control as a gas range. In fact, induction cooktops are trending with chefs who find them to be more efficient, precise, safer and a more flexible way to cook than either gas or conventional electric. Even a smooth top electric stove top is a decent option. Upgrade outlets. If you decide to switch and have not had an electric range before, you might need to do a one time upgrade to install an electric outlet for your new range. The cost of a new outlet install will vary based on your current electricity service capacity and wiring. Check with an electrician to determine what the cost would be for your home. Whether you choose electric or gas, here are the energy efficient features to look for. If you choose a gas range top, pick an electric ignition. If you choose a gas range, be sure to get one with an electric ignition. Older models have standing pilot lights which continuously burn a small amount of fuel—even when not in use. An electric ignition solves this problem by creating a spark to ignite the gas into a flame. This feature is common, but not included in all models, so check to make sure it is included. Electronic ignitions can save up to 30% and typically don’t cost extra. If you choose an electric range top, pick a smooth top or induction range. Smooth top electric ranges are more energy efficient and heat up quicker than exposed coils or solid disk heating elements. The ceramic top which covers the heating element promotes even and rapid heat transfer, which reduces energy use. Induction ranges heat quickly and efficiently while providing performance comparable to a gas burner. An induction range will save you approximately 30% on your energy bill compared to traditional electric stovetops. However, induction electric stove tops are still quite expensive (ranges start closer to $2,000) and it can take years to recover the additional cost through energy bill savings. An induction range is a great addition if it's in your budget. If not, a smooth top electric range is a great option! Go Convection. Convection ovens use a fan to circulate the hot air around the oven during cooking which distributes the heat evenly, reducing the energy use and shortening cooking times. Convection ovens use about 20% less energy than regular ovens, saving you 20% on your bill. It also saves you time with shorter cooking times. The convection option may come as a setting on the oven that you need to choose. If this is the case, remember to select the “convection” setting to get the energy-saving benefits. When the convection setting is off, the oven works just like a normal oven. Convection ovens are a little more expensive than conventional ovens (~$100-$200) but will save you as much as 20% on your oven energy costs. If you cook regularly, this upgrade is worth it! 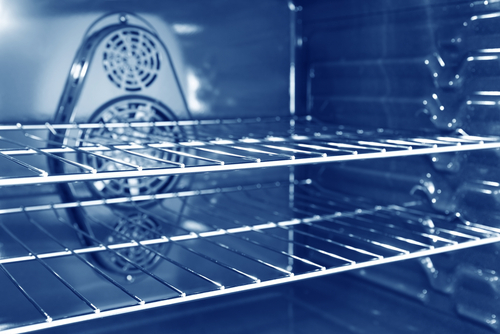 Pick a self-cleaning oven. They have better insulation, which results in more energy efficiency. Also, consider a double oven. Many newer ovens have a double oven option, with one of the ovens being smaller. This can be a great option if you often cook small meals because you can use less energy heating up just a small space. Or you can get a smaller toaster oven unit to use for smaller meals as well. Installation is generally included as an option with most retailers. For electric ranges it may be free; with gas ranges, there is usually a charge for the install. Your old oven is made from steel and aluminum which can be recycled. Most retailers will offer a recycling service and take away your old range when they install your new one. There may be a fee for this additional service. Be sure to confirm with them that the appliances are recycled or refurbished and reused and not disposed of at a landfill. If you are not certain, check the website of your city or county’s municipal waste service. Many have recycling programs that accept large appliances and may even offer a curbside pickup option. Or visit the Recyclenation.com website for a list of local recycling centers that accept appliances. Position your oven and range away from the refrigerator. If too close, the heat from cooking requires the fridge to use more energy to remain cold. Cook multiple dishes at the same time. Cooking in bulk takes advantage of an already heated oven. Thaw food before cooking, this will reduce cook time and energy use. Make use of that nifty oven light instead of opening the oven door every time you want to peek at your cookies. Use ceramic or glass cookware with tight lids—they hold heat better than metal and so you can use a lower temperature or reduce your cook times. Use the self-clean feature after cooking a meal to take advantage of an already warm oven. Flat bottom cookware allows for more contact with heating elements which reduces time to heat. Use a pan that fits the size of the range burner to avoid wasting heat. Turn off the heat for your electric oven or stovetop shortly before your food is done as they will continue to generate heat for a while. Check the seal on your oven door is tight. Replace old electric burners and be sure your gas burners are working properly. For a gas stove, yellow rather than blue flames are a sign that they need adjustment. Clean your burner pans regularly to allow for efficient transfer of heat.